" City Girl " designed by Gary Fletcher for 16" Ellowyne fashion dolls. This stylish and trendy suit includes fitted jacket with vented ruffled cuffs, ruffled collar and front snap closure with mock buttons. The vented cuffs allow you to easily pull the doll's arm through the sleeve. Jacket is fully lined. Fitted skirt features front darts, princess back with zipper closure and ruffled hem. Skirt is fully lined. 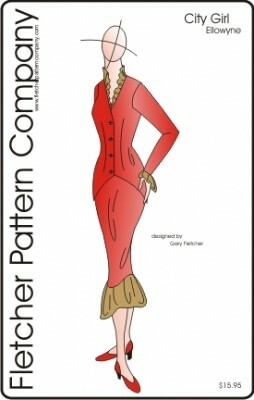 This pattern includes easy to follow detailed instructions with illustrations. The PDF version prints on A4 and 8 1/2 x 14 legal size paper.